in Double Moss st on larger needles; 23 sts and 28 rows = 4" in charted patt on larger needles. Finished Size Cowl: 10" wide and 44" circumference. Hat: 17 (18 ¾ , 20 ½ )" circumference at brim and 10 (10, 11 ½ )" tall. Hat shown measures 18 ¾ ". 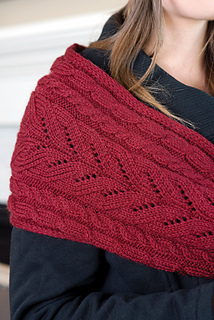 You don’t have to stop knitting lace just because it’s cold outside. Simple lace and cables in a cheery color create bold yet feminine accessories for any winter wardrobe. Finished Size Cowl: 10” wide and 44” circumference. Hat: 17 (18 ¾ , 20 ½ )“ circumference at brim and 10 (10, 11 ½ )” tall. Hat shown measures 18 ¾ “. Yarn The Fibre Company Cumbria (60% merino wool, 30% Masham wool, 10% mohair; 238 yd 218 m/3 ½ oz 100 g): #44 appleby castle. Cowl: 2 skeins. Hat: 1 skein. Yarn distributed by Kelbourne Woolens. 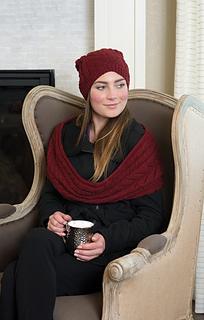 Needles Cowl: Size 7 (4.5 mm): straight. 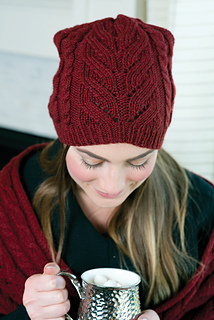 Hat: Size 5 (3.75 mm): 16” circular (cir) and size 7 (4.5 mm): 16” cir and set of double-pointed (dpn). Adjust needle size if necessary to obtain the correct gauge. Notions Marker (m); waste yarn; cable needle (cn); tapestry needle. Gauge 18 sts and 28 rows = 4” in Double Moss st on larger needles; 23 sts and 28 rows = 4” in charted patt on larger needles.